Like the moon, women are full of mystery and beauty! Determined to ace her “History of Women” college course, Claire finds herself at the Willow Library that is nestled in a small New England town resembling a mini castle. There she meets Miss Moon behind her stacks of old leather bound books and beneath her jungle of hanging plants. Many have sought her wisdom. Many destinies she has steered. The little librarian hands her an old book that leads her to a special elderly woman. This woman hints about a ceremony that fuels Claire’s imagination and creates an obsession. 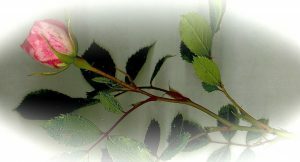 An obsession to find the meaning of the Ceremony of the Rose. Did the ritual really happen? Or was it a folktale passed on by the lonely and frustrated women of Tucker’s Glen? What Claire uncovers is mystery and romance under the spring full moon. The story Ceremony of the Rose was first hand written many years ago. It was the story that introduced Miss Moon’s unique influence, and laid the ground work for the whole Willow’s Moon Song series and its special mythology. I was inspired to write it by news reports and history recounts of how women and their sexuality were seen as “evil”, and could cause men to do “evil things”. I suppose early men were rather taken aback by the “magic” of women’s bodies. And when one does not understand something, the temptation there is to try and control it. Sadly that is what happened to women then, and even sadder, is still happening. Check out my blog posts in Amazons and Moon Goddesses for more thoughts on that topic. This story is a celebration of women. 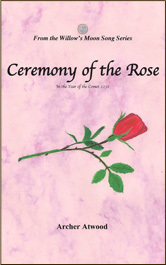 In an earlier version, Ceremony of the Rose was first published on my original website. I felt something was missing. I needed to step up the backstory of one of the main characters. That led me to take Gaelic language classes. Talk about a hard language to learn!! Yet it was just what I needed to spice up the story more, along with a few more additions. Be forewarned, this story is for mature readers. If you blush easy, I suggest you make sure you are alone when you read it! Head over to amazon.com to read a taste of this book. I hope you will enjoy the celebration! And Happy Valentine’s Day!